If you have a UTI, your GP will prescribe you with antibiotics to help get rid of an infection. It’s painful and makes you feel like crap. I had it a couple of years ago and it was the worst, can’t imagine it would be any better with a growing baby inside you. Baby Centre says “Pre-eclampsia is thought to happen when the placenta isn’t working properly. It can make you and your baby quite ill if you don’t receive the treatment you need. Pre-eclampsia causes the flow of blood through the placenta to be reduced. This means that your baby won’t get enough oxygen and nutrients, which may restrict his growth. 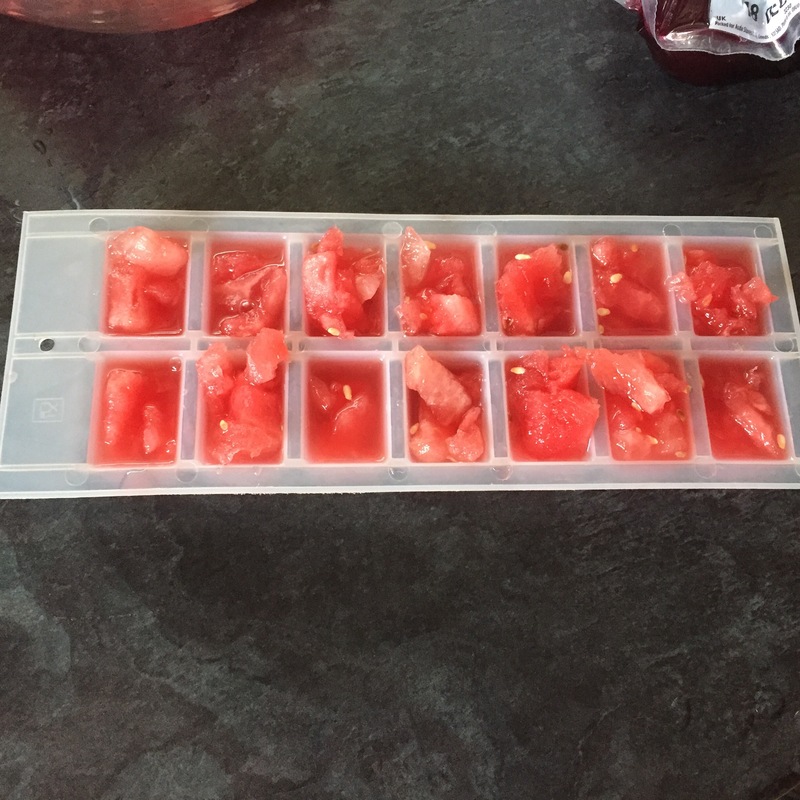 I’m not a massive lover of watermelon but it is a great way to get 1 of your 5 a day and a fun way to jazz up your water intake. Cut the watermelon into chunks, discarding rind. Don’t worry too much if your watermelon has seeds. 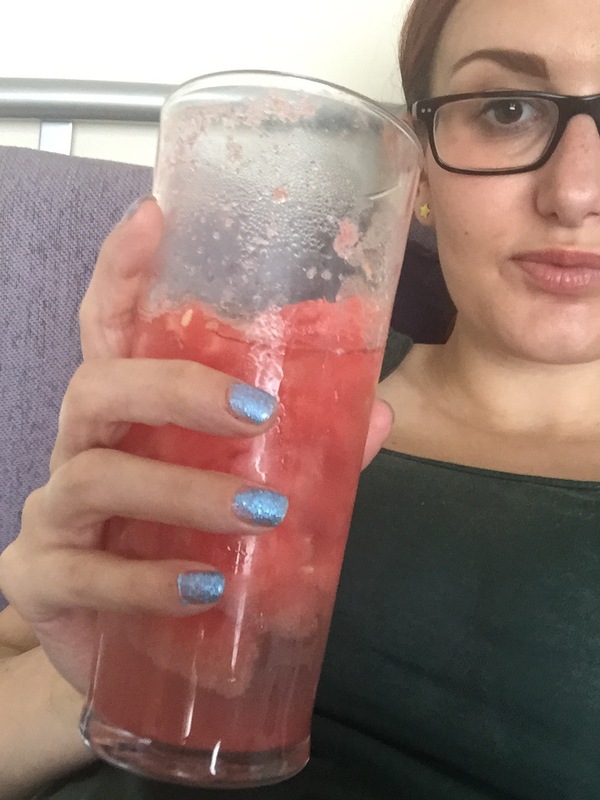 Throw in a quarter of watermelon at a time (you don’t want to block your blender!) with 1 tablespoon of sugar, 1 tablespoon lemon juice, 4 cups of crushed ice and a pinch of salt. Strain through a mesh sieve into a large bowl, disgarding any unbreakable solids and then add to your serving jug. You’ve all heard of Tango, Orangeade, Fanta and San Pellegrino, but being full of sugar they don’t generally make you feel hydrated after. Be creative and add some bubbles (soda water or lemonade) to your favourite juice- orange, cranberry, lemon & lime, pomegranate or whatever tickles your fancy. If like me you can’t resist a good brew, you’ll know if you drink too much of it, especially in this heat, it will actually make you feel dehydrated no matter how many we drink a day. I’ve cut down how much decaf tea I drink a day and bought some fruit infused teas to get myself swapping the tea leaf for a bit of dried fruit and although they taste ok, they can be a bit bitter. PG Tips range of herbal infusions come in 10 flavours, all bursting with flavour, caffeine free and won’t disappoint. My favourites are the Juicy Red Berries and Apple and Cranberry. It’s best to enjoy this cuppa infuse with freshly boiled water for 4-5 minutes and why not add some fresh fruit to the mix too. I’m in love with their Rooibos (Afrikaans for ‘red bush’) and Honey Bush tea within their red selection, I also love their Super Fruit Tea made with cranberries and blueberries and Chocolate and Mint tea, which tastes a hell of a lot like mint choc chip ice cream. Twinings have been making tea for as long as I can remember. Their naturally sugar-free teas with just 4 calories a cup are a winner hot or cold and only cost around £1.60- £2.00 for a pack of 20 teabags in comparison to Teapigs £4+ and PG Tips £2+. My favourite of their teas include Mango & Strawberry, Strawberry & Raspberry, Cranberry & Blood Orange, Mango & Lychee Green Tea and Pineapple & Grapefruit Green Tea. Or try making your own. Throw in some fruit into the mix. Fresh fruit can help your water look pretty and taste yummy. Try also turning your fruit into ice cubes to pop into your drink when thirsty. You can be creative with any bit of fruit that tickles your fancy. Yes you read that right, eat something instead. ‘Fruits are 80 to 90% water, and you’re getting a bunch of good nutrition that people tend to miss in their diets–potassium, fiber, folate, vitamin A, vitamin C.’ Says Alan Aragon, MS, a nutritionist in Westlake Village, CA. Vegetables will do the trick too. Aragon suggests a salad of tomatoes, onions, lettuce, cucumbers, and other water-rich greens. So snack snack snack away. There is a God! 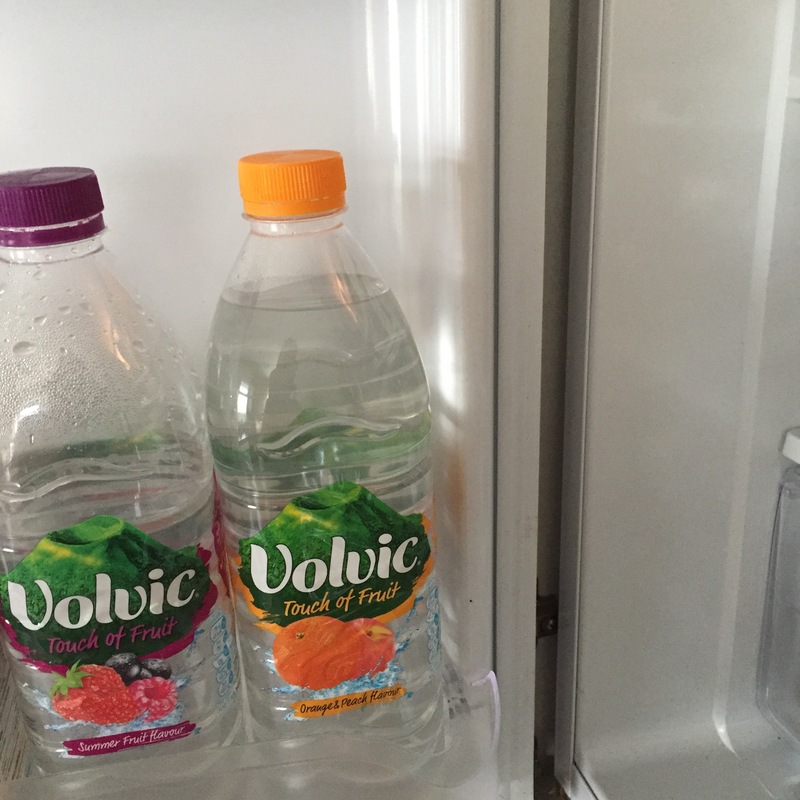 Thankfully a genius mastermind thought the unthinkable and developed fruit flavoured water. Not as strong or bitter as squash just a hint of our favourite fruits that looks like water, tastes and smells like fruit. Bonus! Tip: Remember to sip not down a glass of water. You’ll reap the benefits if you sip more than gulp. Trust me! I’m still struggling to drink enough water, but am slowly tricking myself to do so, but for the sake of my little one I need to kick myself up the arse more and do it. Are there any tips that I’ve missed that you’d like to share? Congratulations on the arrival of your little one. Kidney stones must be a nightmare, I’ve had a UTI before pregnancy and that was horrendous but couldn’t imagine that on top of being pregnant. Drinking with a straw is helpful- especially when out, makes the whole drinking water experience feel so much more exciting!